What a strange day. For one thing, it was commuting hell for me, both directions yesterday. Notable, in part, as compared to the norm of general smooth sailing success I enjoy during the early shifted hours I drive for the four days of the week I commute to the day-job. I won’t get into the disorientation of facing the day-job in a building that unexpectedly has no running water while the city looks into a break in a pipe. Don’t ever take for granted the convenience of a working indoor sink and toilet in your daily goings on. No, the strangeness in my day was primarily marked by the sudden and unexpected contractions of three lanes into one at a construction site in the darkness of early morning. 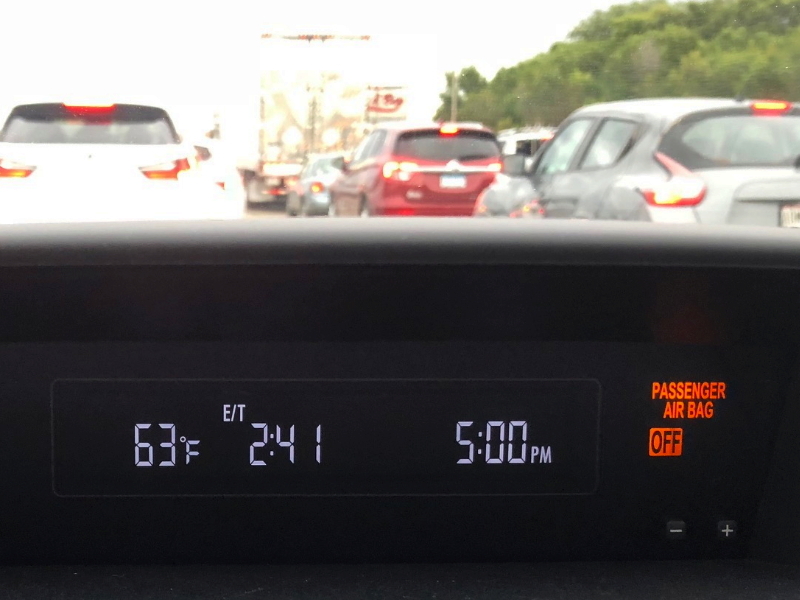 Twenty added minutes of my morning that made the drive to work feel like an eternity, as compared to the usual hour that slips by as I zoom in the fast lane with the other early worker bees whizzing to their places of employ. Twenty minutes was a blink compared to the trap which ensnared me on my attempt to get home. After battling the strangeness of a particularly unsettling day at work, I tried sneaking out a little early to dash through the cities toward home to pick up Cyndie and race back downtown for a big date. 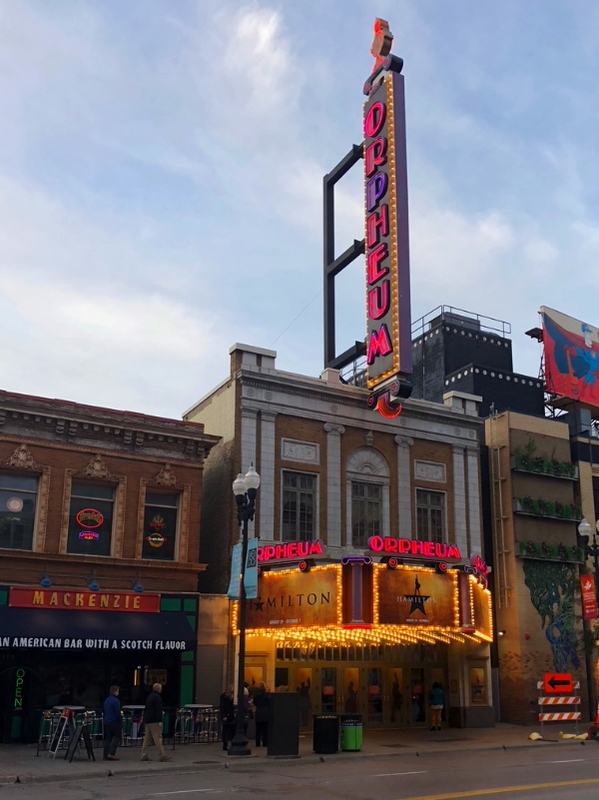 We were gifted tickets to “Hamilton” at the Orpheum Theater! An anniversary present. I dashed through the cities alright, but there was a calamity ahead to which I had no warning. 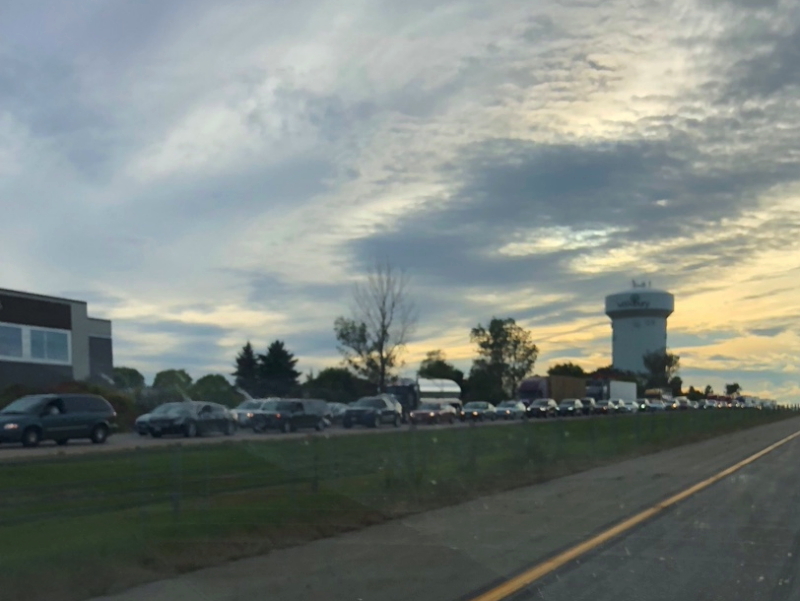 In a normally unobstructed straight stretch of I94 in Woodbury there were suddenly brake lights in every lane. It wasn’t just slowing, either. We came to a stop. Then crawled and stopped. And stopped. Really? Twice trapped in one day? Unbelievable. Good thing I left early. Obviously, not early enough. Whatever the incident was that now obstructed my progress, it didn’t show on the map when I departed. No, I did not have my traffic app running to warn me in advance. I know. Minutes turned into hours. It was so bad, I ran out of time to get home in order to turn around and head back again. Cyndie had to leave home and drive toward me. What would normally take me 40-minutes to achieve lasted almost three hours. 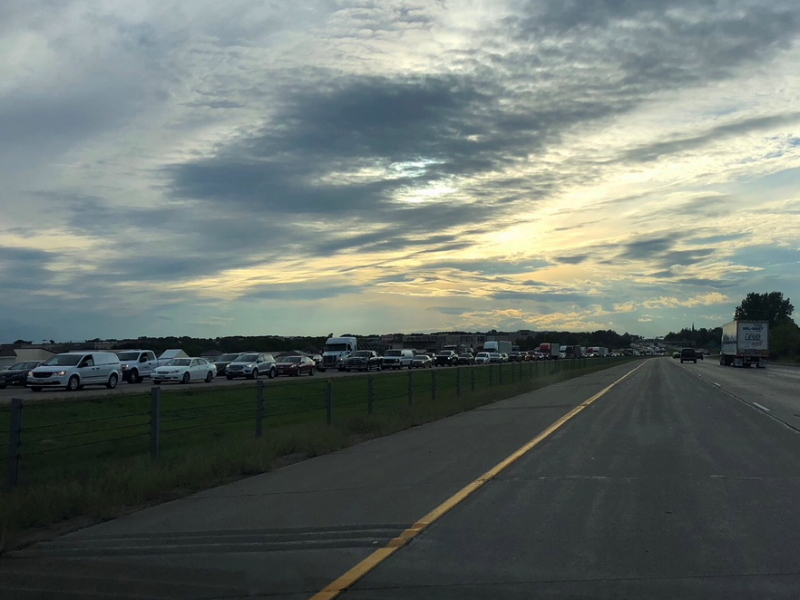 Three lanes, plus a merging on-ramp, were squished down to one at the bridge over the St. Croix where Minnesota becomes Wisconsin. When I reached the incident, the scene looked like a truck had exploded and burned. Maybe it happened the other way around. The parts of the cab and engine were scattered and the trailer looked ripped open and melted back. I parked my car in Hudson and she picked me up to drive to Hennepin avenue. As we headed west again, the scenery of the backup I had just escaped was heart breaking. It was three times as long as where I first encountered it, and it took me two hours to clear. They were in for a real test of patience, and likely a need for a bathroom. All I wanted to do was be out of a car, but sitting in the cramped seating on the third story balcony for a special broadway show turned out to be almost as uncomfortable. Luckily, “Hamilton” is quite something to experience, so I was able to endure the discomfort for the spectacle of sight, sound, and history crafted in a fantastic display. As great as it was, it also served to contribute one more unusual thing to a really strange day. On the way home at the end of the night, as we wheeled along the interstate where the backup had occurred earlier, we passed more than 50 semi trucks that had pulled over. I’m sure they just called it a night and used their required sleep hours right then and there. At least I got to go see a fabulous show. It really was a very strange day.